In Contra Costa County, there have been efforts to make WRAP available to members of the mental health community since Mary Ellen first spoke here in 1999. The MH Administration hired me as a “Wellness Recovery Educator” in April 2001 to work on a variety of Consumer Empowerment issues, including the implementation of WRAP as part of the Adult System of Care. This included providing in-service trainings and working to strengthen and support the efforts to maintain consumer-lead WRAP groups. As much as the Administration supports the idea of WRAP, finding funding to pay consumer leaders to maintain consistent groups at various locations throughout the county has been challenging. With the closure of one of the four community centers, Mental Health Consumer Concerns had the opportunity to redirect funds to support the activities of the other three centers. 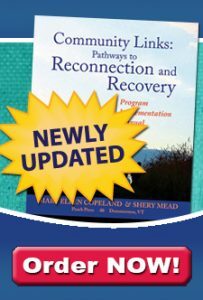 Through MHCC, we are just preparing to hire “Recovery Specialists” who will lead regular WRAP groups in each region of the County, promote the idea of Recovery by demonstrating the reality, and act as peer mentors by teaching self-help strategies and helping people to actualize their goals. In addition to this formal program that is just about to begin, there are several other ways in which WRAP is being used to create very positive results. The WRAP Crisis Plan has been adapted to a form that will be included in an easily accessible location in each client’s chart at the outpatient clinics, psychiatric emergency services, and inpatient hospitals. If people choose to, they can also have a legal advanced directive form included in this location in their charts. The Office for Consumer Empowerment WRAP Team will be providing training for all medical staff involved in the use of these charts. The “consumer-provider” staff of the Office for Consumer Empowerment and Mental Health Consumer Concerns has a voluntary WRAP Group that has been meeting over a long period of time. Our most recent focus has been to identify what kinds of symptoms would be visible to co-workers if we were nearing “Breaking Down” or Crisis stages. Then we came up with a list of responses that we would like our co-workers to use in order to best support us in such a time. Although our agencies don’t currently use a formal system to provide reasonable accommodations, it is our hope that creating these personal directives that we will formulate a system in which our plans can serve as individualized guides to our needs if we should ever develop severe symptoms. Mental Health Consumer Concerns has periodically offered the “Mental Health Service Provider Training” for consumers who wish to work as peer counselors, Community Support Workers, or in other consumer-provider positions. This year, we used the WRAP as the basis of our self-care emphasis, and found that WRAP works very effectively in that setting. Students were able to both make use of the plan personally to prepare for the challenges of employment, as well as being equipped with a valuable tool to share with other consumers. Students practiced group facilitation skills in small WRAP groups in class. Some of the graduates of this program will be hired as Recovery Specialists.